Nick Diaz’s longtime manager, Cesar Gracie, recently tried to stir the welterweight pot by suggesting his protégé should get to leapfrog back into a championship bout should he finish BJ Penn at UFC 137. Company president Dana White quickly killed that chatter following Thursday’s press conference by professing Carlos Condit’s (Pictured) next dibs status is secure. “No, Condit’s in,” White emphatically stated. “Condit’s sitting and waiting. [Georges St-Pierre] should be [out] six to eight weeks. He’s just gotta have some rehab on his knee. Hopefully it doesn’t lead to surgery. GSP might need to go under the knife? Diaz was originally scheduled to challenge St-Pierre for his 170-pound crown at UFC 137, but watched the opportunity of a lifetime get yanked out from underneath him after ditching back-to-back press conferences to promote the pay-per-view broadcast. 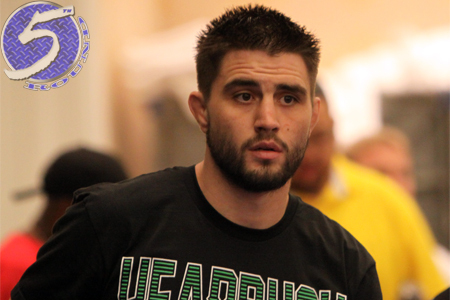 Condit, who was slated to co-headline the show opposite Penn, was promoted to the championship affair. Unfortunately for fight fans, St-Pierre injured his knee and hamstring last week and was forced to withdraw from the contest. St-Pierre is aiming for a February 2012 return, hopefully during Super Bowl weekend. As long as the injury bug doesn’t rear its ugly head again, Condit will mark his next title defense. Meanwhile, Diaz and Penn will headline Saturday’s show inside the Mandalay Bay Events Center in Las Vegas, Nevada.